"Using Iron Speed Designer helped me save an entire person-month of development time and £7,000 of development costs." 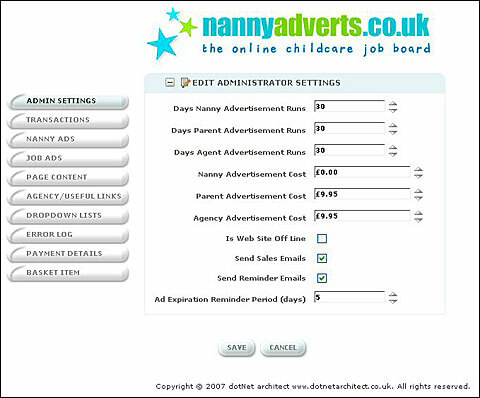 The Nanny Adverts Admin application manages administrative functions for NannyAdverts.co.uk, a UK-based nanny and job advertisement site. The company offers the main site to all users seeking to place either a nanny advertisement or job advertisement for a nanny, babysitter or other care provider. The application maintains all behind-the-scenes content, administration and reporting for the administrative staff at the company. The application has two levels of users, "admin" and "superadmin". The admin website used in this case study is protected by role-based security to restrict access to admin users only. Admin users can track nanny and parent sign-ups and advertisement purchases as well as perform general housekeeping tasks such as updating dropdown lists, email content, product pricing and commissions via Nanny Adverts Admin. Admin users can also create and amend application content directly. Third-party controls are integrated into the application that provide Microsoft Word-like editing of page content, freeing the administrative staff from expensive and time-consuming requests to the IT team. This includes real-time spell checking, image placement and uploading and hyperlinks giving the admin content author full control of page content. Superadmin users have all the functionality of the admin users with additional screens to monitor error logs, financial transactions and shopping basket information. This information is only available to IT members with the superadmin role. Users have control over the main system pricing. Users are required to log into the application at startup; no part of the admin application allows anonymous access. Once logged in, users can monitor the registration and sales of the various advertisements from nannies and parents. Administrative staff can also monitor and vet useful links that users have posted as well as links from agencies wishing to publicize their company, as well as to veto any unsavory wording or picture uploads. The content author can also change dynamic content, such as information appearing on the front page, FAQs, etc. Two Microsoft SQL Server databases comprise approximately 80 tables and 82 database views. The largest table is the OrderTransactions table, which currently holds 650 records. This table continues to grow over time as new orders are received. The application includes 90 web pages and process over 200 transactions each month. The project took ten days to implement, half of which I spent working on the Iron Speed Designer portion of the project. An administrator can upload customer logos into the application. Telerik upload control for file validation and uploading. Telerik Editor control for content editing and management. 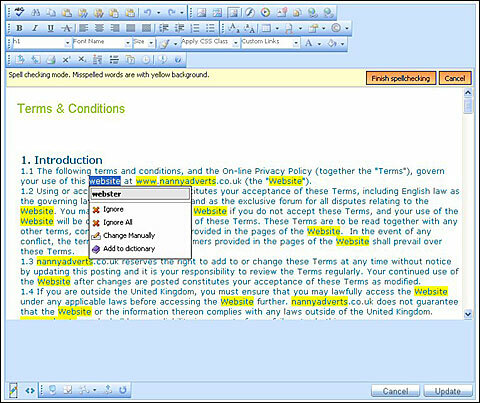 Users can edit and spell check page content in real time. Over 200 lines of custom code were incorporated into the application over the course of one day. I used the White design theme provided with Iron Speed Designer. Using Iron Speed Designer helped me save an entire person-month of development time and £7,000 of development costs. This project would have required at least six weeks of additional development if implemented by conventional hand-coding. Tim Titchmarsh has over 25 years software development and management experience in the computer industry. He earned a Higher National Diploma in Computer Science Studies in 1986, and set up his own software consulting and development company in 1997. His company, Dot Net Architect, specializes in Microsoft technologies. He has won contracts with many blue chip clients both in London and Zurich including USB Global Asset Management, Accenture, Commerzbank and Amlin Insurance and has gained a reputation for "getting things done". Tim is a member of the Microsoft MSDN Visual Studio Team Developer and The Microsoft Partner Program. He also contributes greatly to the Iron Speed community as an Iron Speed MVP.